Three bloggers I admire very much have nominated me for a Sunshine Award. I feel so honored to be included on their lists of “bloggers who inspire,” lists that include the names of many bloggers who inspire me. Over the next day or two, I will answer all their questions and come up with my own list, but until then, I’m going to answer one question that both Amy and Michelle asked: What is your “one little word” for 2014? Balance. We hear this word everywhere. Balance your checkbook. Eat a balanced diet. Balance your tires. Entire Eastern religions are built around the idea of balance. In art, balance is achieved when no single element of a work overpowers another. So why is it so easy for our lives to become unbalanced? How is it that we forget the importance of eating right, exercising, doing things we love, and finding time for friends and family every day? I took this picture at Point Judith lighthouse in Rhode Island last September. 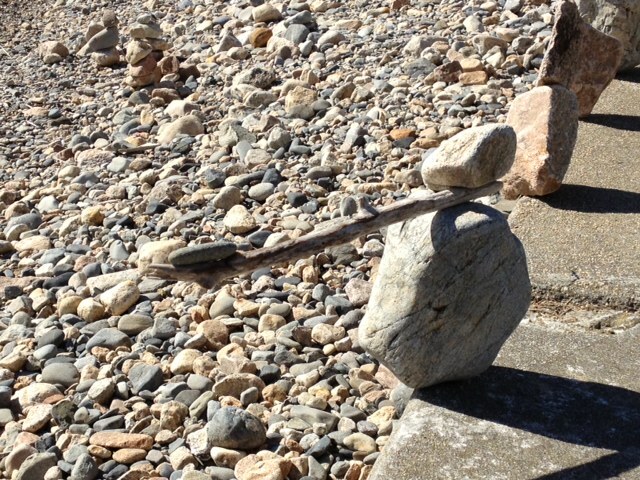 The asymmetry of the construction of this cairn intrigued me. How does the small stone on the left remain poised on the end of the stick? Does the stability of the larger rock on the right allow this? In 2014, I want to be the small stone on the left, poised on the brink of whatever the day brings, yet able to maintain my balance. Just as bridges have firm footings and extra capacity (thanks, Anne!) that allows them to withstand forces of use, wind and weather, the firm foundation of the large rock keeps this cairn in place. I think that if our beliefs are solid, if we know our own mind, we have a firm foundation for our choices, both personal and professional. We may waver or deviate a little, after all flexibility is a good thing, but with secure footing and a good support system, we’ll be able to withstand whatever life throws at us. Cairns have been used since prehistory to mark trails. This cairn will be marking my path through 2014, helping me to keep my balance. Thank you to everyone at Two Writing Teachers and all my fellow slicers for their friendship and support over the past year. Wishing you all a happy, healthy, and balanced New Year! On Sunday, my friend June and I went to see The Nutcracker. Dancers from a local theater and dance studio performed the ballet to Tchaikovsky’s beloved music. The cast was full of students from my school and it was wonderful to see them in a different light. Each dancer’s face beamed as they jetéd and glissaded across the stage. As I watched them, I was reminded of something I had read earlier in the day about yoga and the belief that “there is a Divine spark within each of us that is located in the heart chakra.” (Yoga Journal) Their Divine spark was shining through, bringing joy to every person in the auditorium. June and I have known each other since Kindergarten. Our friendship has waxed and waned over those almost 50 (gasp!) years, but we have always been bound together by our love of music and dance. We started ballet class together when we were in second grade, and we sang together in chorus through all our years of school. We sing together still in a local choral group. Yet somehow, neither one of us had ever seen a performance of The Nutcracker. What more appropriate way for us to celebrate Christmas than by watching one of the most famous ballets in the world? Thank you to everyone at Two Writing Teachers for providing this space to kindle our divine sparks. Wishing you all a season of light filled with love and joy and peace, filled with friends old and new. ‘Tis the season for traditions. Every family celebrates the season in their own way, and singing Christmas carols has always been part of Christmas at our house. Beloved carols and songs fill the air as we decorate the tree, bake cookies and wrap gifts. One of my favorite carols is “O Holy Night.” The music was composed in 1847 by Adolphe Adam for Placide Cappeau’s poem “Minuit, chrétiens.” In 1855, John Sullivan Dwight adapted the the poem and created the lyrics we sing today. Fall on you knees! 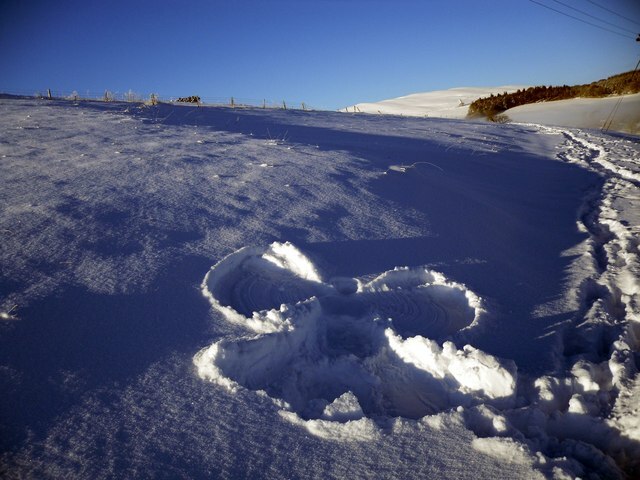 O hear the angel voices! Wishing you all a holiday filled with love and joy! Be sure to visit Buffy Silverman at Buffy’s Blog for the Poetry Friday Round Up. I am a pack-rat. I hate to throw anything away. My cousins and I tease each other that this must be genetic because my grandmother saved EVERYTHING. I have a love/hate relationship with this part of my personality. On the one hand, the piles of boxes and books in my attic and office drive me crazy. On the other hand, I can usually find what I’m looking for and am glad that I still have whatever it is I’m trying to find. Happy to know I didn’t have to search for something to wear, I was faced with another dilemma. I like my sweater. I don’t think it’s ugly. That’s why I still have it. I was relieved to find out that other people agreed with me. (Although maybe they were just trying to be nice.) Still, I felt better when I saw my friend Cathy. 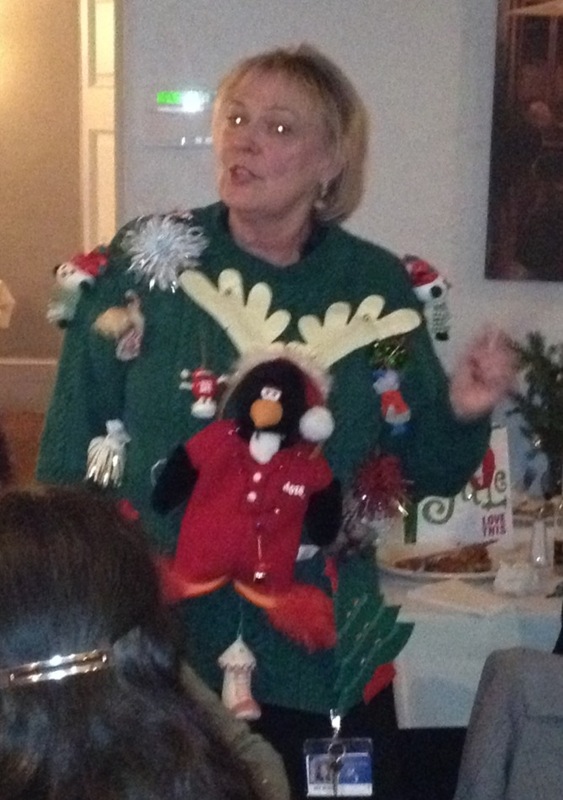 The winner of the contest didn’t have an ugly sweater, so she created one by raiding her Christmas decorations. All this good-natured fun got me thinking, though. 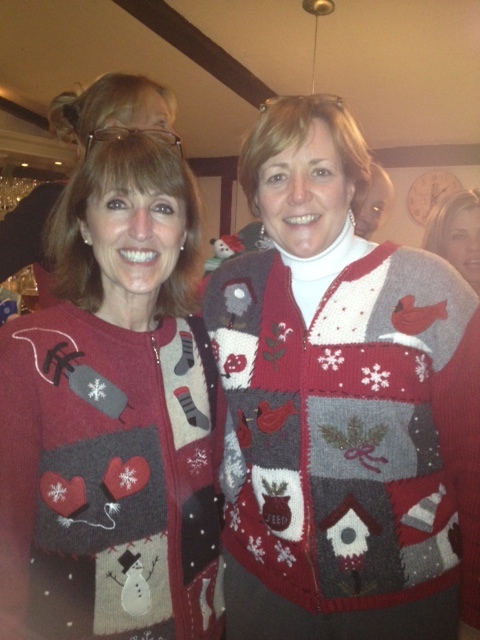 Even if my sweater wasn’t ready for the donation box, are there elements of my teaching that are? Am I clutching to an activity or practice just because I’ve always done it? I like to think that I’m reflective and objective about this, but I’m not sure. I definitely have favorite books and projects, but I also read new books and am always on the look out for ideas that will improve my teaching. The truth is we get comfortable with materials and routines. It’s scary to change our practices and habits. But is this in the best interest of our students? When I talk with colleagues about lessons or activities, I always ask them, “How does this help our students grow as readers and writers?” If there isn’t a good answer to this question, then we have to let it go. By the same token, we shouldn’t be in a hurry to toss everything over for some shiny new program. If a practice is effective, we should keep it. We may need do some tweaking, but there’s a big difference between abandoning and modifying. We have to trust ourselves to make good decisions in this time of rampant change. And don’t throw that sweater away. You never know when it will be exactly what you want to wear. 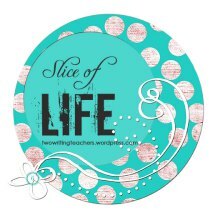 Thank you to everyone at Two Writing Teachers for sharing your slices. Your stories always give me new ideas to think about. I originally posted this on December 21, 2012, one week after the tragedy at Newtown. I am posting it again today, in a slightly modified form, in honor of the teachers and children who died that day. We owe it to the dedicated educators who died to take up their “dear unfinished tasks.” We must do everything in our power to create a world filled with love and joy; a world where all children can grow and flourish into the fullness of themselves. I finished reading Christopher Lehman and Kate Robert’s new book, Falling in Love With Close Reading (Heinemann, 2013) last week. Kate and Chris have done a terrific job articulating the elements of close reading. At the same time, they encourage teachers to be purposeful about using close reading strategies. Close reading is not something to be done on every page of every book. Their main point it that close reading should be done when there is a deeper understanding to be gained. All week I’ve been thinking about the application of these ideas in the classroom. I have been looking at texts differently since reading Falling in Love With Close Reading. Noticing patterns I might have skimmed over in the past, or asking myself, “I wonder why the author chose that word.” All this thinking reminded me of “The Secret” by Denise Levertov. Please visit Tabatha at The Opposite of Indifference for the Poetry Friday Round Up. Every year in late November, my town library hosts a cocktail party/silent auction fund raiser to kick off the holiday season. People donate gift baskets, wreaths, and gift cards to local restaurants and businesses, but the highlight of the event are the Christmas trees. The decorations on each tree are inspired by a book, which is of course part of the package. My dear friend, Colette (of Used Books in Class fame), and I have been contributing a tree for at least the last 15 years, and it has become one of my favorite holiday traditions. 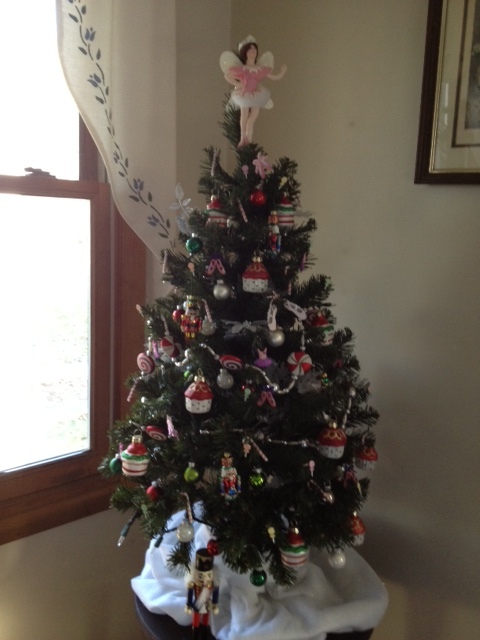 Our trees have most often been based on a children’s book, but we have done a few trees based on adult books. Our Under the Tuscan Sun tree was especially beautiful. Sometimes we’re inspired by the book itself; other times we find an ornament that strikes our fancy. 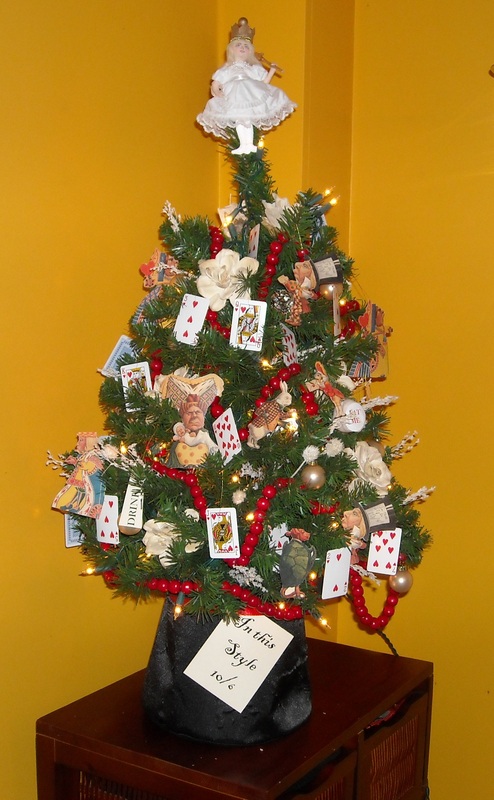 Many of our trees were inspired by the incredible handmade soft sculpture ornaments by Gladys Boalt. These usually adorn the tree top. The rest of the ornaments are generally a mix of purchased ornaments and ornaments that we make. We’ve gotten very creative over the years about making ornaments out of almost anything. Tiny terra-cotta flower pots and raffia became bells on the Tuscan tree, yellow grosgrain ribbon was transformed into the yellow brick road with the help of a black Sharpie, and a hand-knit I-cord became the garland for a tree full of little sweaters and hats. Ideas for a tree can strike at any time of the year. Colette is usually the mastermind, but I’ve had my share of brainstorms too. 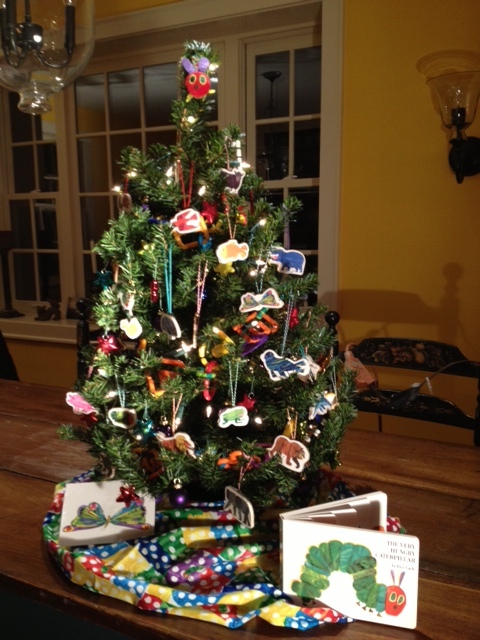 This year’s tree was inspired by a set of wooden magnets Colette found in the gift shop at the Eric Carle Museum back in March. With the help of brightly colored bakery string and scrap book paper (to cover the black backs), these adorable magnets became ornaments. 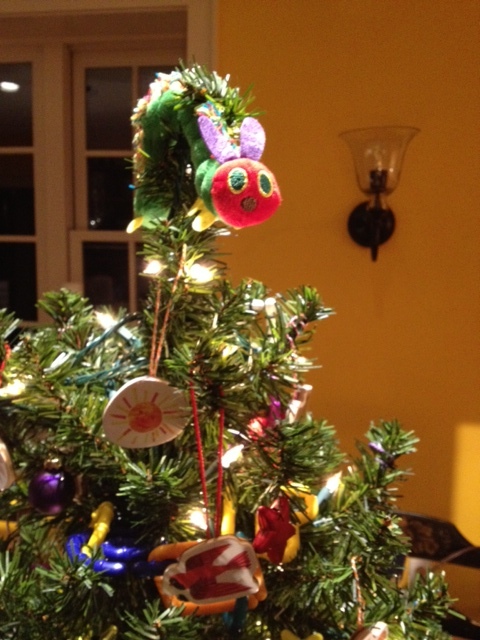 Plastic alphabet links were turned into a garland, and the Very Hungry Caterpillar himself sat atop the tree. Every year we ask ourselves why we do this, as it takes a fair amount of time to make sure we have all the materials we need, make the ornaments, and decorate the tree. Trees have to be delivered to the library (a big challenge in itself!) right before Thanksgiving, a very hectic time of year for teachers. But every year, as we’re making the ornaments, we remember why we do this. We love it. We love supporting our local library. We love using a creative part of our brain that we often neglect, and we love creating beautiful Christmas trees that bring joy to someone. 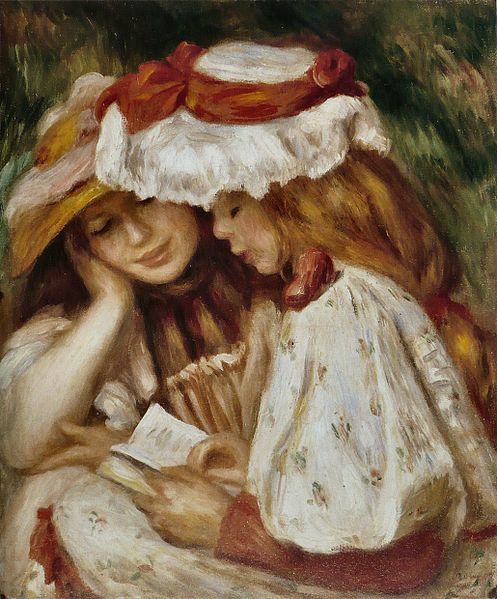 Most of all, we love giving a child a book they will never forget. Thank you to everyone at Two Writing Teachers for creating and nurturing this supportive community!